I would think that a ventriloquist could measure his success by whether one of his puppets is better known than he is. Well, I am sure that this is the case with the Puppet Guy. Mention Chester Missing and everyone will immediately know who he is. That political analyst of TV fame. Mention Conrad Koch and many will shake their heads, and probably not know who he is. Well, Conrad Koch is the brains and voice behind Chester as well as a bunch of other innovative and irreverent puppets and random inanimate objects, as well as various audience members talking out of turn during his hilarious show, The Puppet Guy. Koch’s show is quick-witted, relevant and insightful. There is intellect in what he does. Unlike some of what is seen on American TV. Although he interacts a lot with the audience no-one is insulted or humiliated. No-one, that is, except Koch himself who suffers considerable abuse from Chester Missing. The puppet is uproariously merciless in mocking Koch and pointing out his short comings. Oh, I forgot. That, of course, is Koch talking about himself. Well, that is how good and convincing he is with his ventriloquism. The show starts with two sock puppets spotlighted in the dark theatre, arguing and making political comment. They are very funny and set the tone for the rest of the show in which the laughs keep coming thick and fast. Also appearing are Hilton, an ostrich sort of character made from two feather dusters and a slipper, a strange DJ, wearing a hoodie and manipulated by Koch’s feet and a member of the audience whose hilarious electronically-distorted facial expressions are projected onto a screen. He is forced to jabber away ridiculously and even to sing like Pavarotti. Chester Missing also becomes a ventriloquist himself with a disturbingly good impersonation of the Democratic Party’s Helen Zille. Finally, two hapless audience members are called on stage and rigged out with masks of, alternatively, a lion and a warthog. They have an outlandish and sometimes naughty conversation with each other without ever, in reality, saying anything. 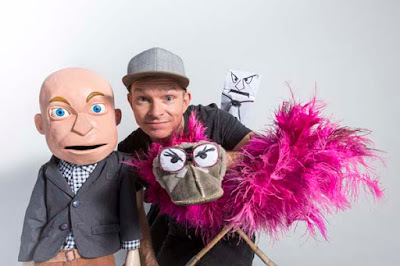 The Puppet Guy is comedy a little different from the run of the mill stand-up. Well worth seeing, but prepare for sore ribs from laughing.